Fermentation is a chemical reaction in which sugars are broken down into smaller molecules that can be used in living systems. Alcoholic beverages, such as beer, wine, and whiskey, are made from the controlled use of fermentation. Fermentation is an anaerobic process. It is a metabolic process in which an organism converts a carbohydrate, such as starch or a sugar, into an alcohol or an acid. 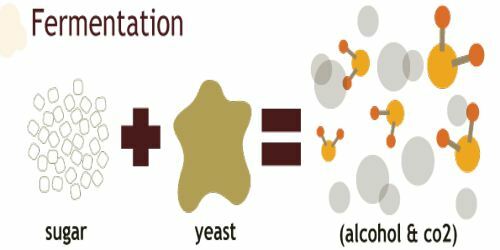 For example, yeast performs fermentation to obtain energy by converting sugar into alcohol. Bacteria perform fermentation, converting carbohydrates into lactic acid. Fermentation is a natural process. People applied fermentation to make products such as wine, mead, cheese and beer long before the biochemical process was understood. In the 1850s and 1860s, Louis Pasteur became the first zymurgist or scientist to study fermentation when he demonstrated fermentation was caused by living cells. Fermentation results in the production of energy in the form of two ATP molecules, and produces less energy than the aerobic process of cellular respiration. The other end products of fermentation differ depending on the organism. In many bacteria, fungi, protists, and animals cells (notably muscle cells in the body), fermentation produces lactic acid and lactate, carbon dioxide, and water. Here are some definitions of fermentation. They range to informal, general usage to more scientific definitions. Any metabolic process that releases energy from a sugar or other organic molecules, does not require oxygen or an electron transport system, and uses an organic molecule as the final electron acceptor (most scientific). Fermentation is a metabolic process in which an organism converts a carbohydrate, such as starch or a sugar, into an alcohol or an acid. 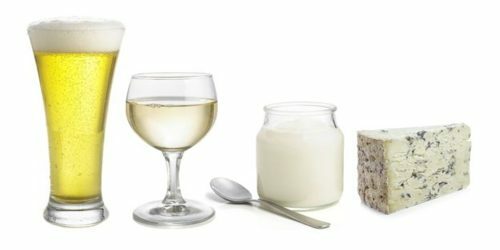 Fermentation products contain chemical energy, but are considered waste products, since they cannot be metabolized further without the use of oxygen. 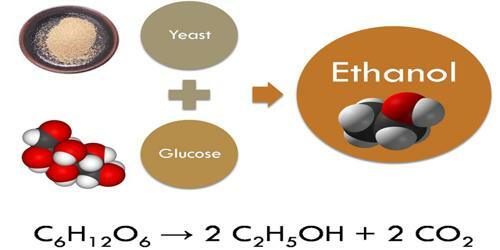 Ethanol fermentation has used the production of beer, wine, and bread. It’s worth noting that fermentation in the presence of high levels of pectin results in the production of small amounts of methanol, which is toxic when consumed. 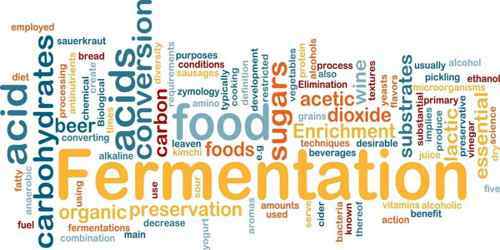 Fermentation occurs when a microorganism, such as yeast or bacteria, converts carbohydrates into another chemical. It is one of the first chemical reactions human beings ever observed. Between 10,000 and 15,000 years ago, fermentation helped people make the transition to farming. The use of fermentation, particularly for beverages, has existed since the Neolithic and has been documented dating from 7000–6600 BCE in Jiahu, China, 5000 BCE in India, Ayurveda mentions many Medicated Wines, 6000 BCE in Georgia, 3150 BCE in ancient Egypt, 3000 BCE in Babylon, 2000 BCE in pre-Hispanic Mexico, and 1500 BC in Sudan. Fermented foods have a religious significance in Judaism and Christianity. The Baltic god Rugutis was worshiped as the agent of fermentation. Today, it is used for fuel as well as food.